“Poor Edith,” Downton Abbey fans have said over and over, year after year. Poor, poor Edith. And I’ve been sorry for you, truly, even as the seasons dragged on and your perpetual bad fortune made you a joke, a jinx, a Jonah. But now… Edith, now you are bringing sorrow upon yourself. In last week’s episode, you broke free of the orbit of Downton Abbey. You left behind your curmudgeonly father, your unsympathetic sister, your sympathetic but ineffectual mother. You escaped the repressive atmosphere of stifling correctness and stifled expectation that has brought you such misery for the five seasons we’ve been watching, and probably well before that. 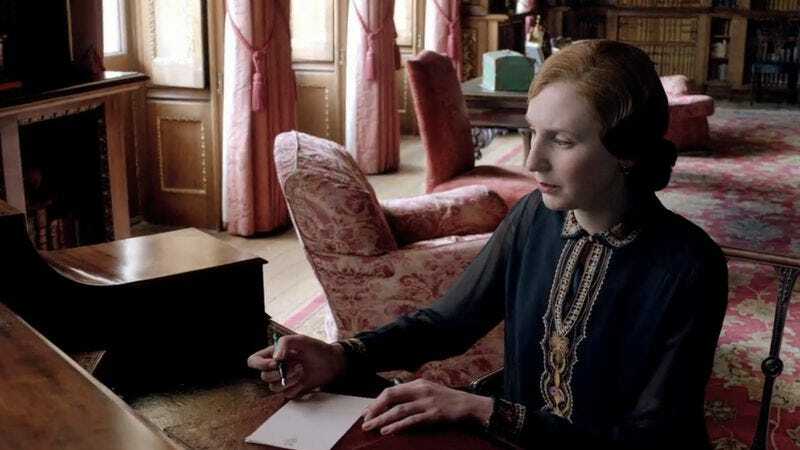 After twelve years being disappointed, disillusioned and thwarted—twelve years as Downton Abbey’s walking embodiment of the sad trombone—you finally left to see if you could build a better life for yourself, for your child. You claimed Marigold honestly as your daughter, even if you hoped the lie of a dead husband, a legitimate father would protect you (and her) from scandal. You braved the perils of a world outside the sheltering, smothering walls of the manor house. You got out. Edith, watching you carry your child into that hotel room, I saw the cheerless and challenging road ahead, and I cherished hopes for you anyway, because you had done something to build your own life, not the life plotted out by your family and position. Then halfway through the next episode, you’re right back at Downton, telling a variation of the same lie that failed you last time. You’re back under that roof with your father calling your dearest desire “idiotic” and Mary chiming out bored agreement. You’re back in that family nest, being upstaged by a sick dog. I wish I could say it’s a surprise, but that’s the nature of Downton Abbey. Its orbit is hard to escape. Oh, kitchen maids, footmen, and housemaids may skip off to America or London, but most major characters are fated—doomed, even—to circle the manor for as long as their stories entertain, or as long as the actors will bear. Matthew Crawley left for Manchester, and then for the trenches of the Somme; Sybil married the chauffeur and moved to Dublin. But both came ineluctably back to Downton, finally freed from its magnetic pull only by death. Many characters’ long-term residence make sense, but some require contortions of plot and logic so silly, they become downright threadbare. Lord Grantham fires Bates himself, then woos him back. A sentence of life imprisonment is nothing more to Downton Abbey than a contortion for a half-season. Lord and Lady Grantham have both fired Thomas Barrow, but neither thieving nor blackmail nor even WWI could keep Barrow from being drawn back into the great house. Cora refuses to dismiss Baxter, rationalizing (with a loveable touch of folly) that a jewel thief isn’t unfit for a job tending to her jewels. The pull of the estate is also the pull of the show. 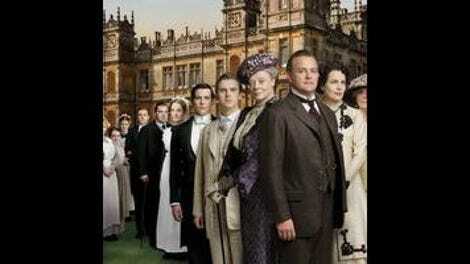 Few major characters escape for long because Downton Abbey must revolve around the manor or lose its center. That’s not true of all, or even most, dramas. Mad Men manages to jump from Manhattan to Los Angeles without losing pace or punch, and Breaking Bad follows characters all over the map, from Mexico to New Hampshire, without losing its bearings—but Julian Fellowes isn’t Matt Weiner or Vince Gilligan, and probably has no desire to be. There’s a reason people return to Downton or drop out of the story. I don’t think Fellowes’ interests, or his storytelling strengths, lie with a single mother in London running a smart magazine, or a cook who leaves service to run a farm with her elderly father-in-law, or a former chauffeur raising his small daughter in America. This focus on the manor is both reductive and, occasionally, exalting. It’s hard for viewers to invest emotionally in, or even give credence to, a story line promising to pull a major character free from Downton’s domain, if only because it’s become hard to believe anyone will. But there’s a flip side, too: Because escape is so hard, so unlikely, so very nearly forbidden by the author of their fates, when an important member of Downton Abbey does leave the estate for good, it’s more than exciting. It’s heady. It’s almost taboo. Escape is possible, Edith, but it’s not easy. Molesley’s offer to tutor Daisy is more than a kindness; it’s a way to see his own long-dormant dream bloom again, a chance to help Daisy escape what he cannot. This week, Molesley continues to encourage Daisy in the long, sometimes arduous process of escape. When she loses hope, discouraged by political logjams that reinforce her sense that she’s “trapped, held fast in a system that gives us no value and no freedom,” Moseley suggests an outing to Mr. Mason’s farm, where the old man’s fondness, the fun of a day trip, and the glimpse of her possible future buoy her spirits and remind her that there is life outside Downton. Bates and Anna are thinking of a life outside Downton Abbey, too, making cheerful plans for a future home and a family despite the continued scrutiny of the police. Bates admires Anna’s optimism: ”Where I see a problem, you see only possibilities.” The Bateses face plenty of problems, but they know how to take pleasure in the happier possibilities ahead. It’s escapism, but it’s also a practical way of seeing beyond their present troubles, a way of constructing a life to which they might one day escape. Rose doesn’t need to escape, because Rose knows how to make the life that was chosen for her the life she chooses, too. Even before her parents’ divorce, their rancor taught her the importance of a felicitous match, and her father’s given her “a blank check,” a promise that she may marry as she likes. Edith, perhaps it’s too late for you to benefit from Rose’s example, but you could profit from the advice Mabel Lane Fox gives Tony: “Some people choose to be happy, and others select a course that leads only to frustration and disappointment.” Edith, some of your disappointments have been visited upon you, but now you are choosing them. Look at the problems and the possibilities before you and choose wisely. If Branson actually leaves for America with Sybbie, I’ll be gobsmacked—and all the more impressed with that plucky socialist. For a while now, I’ve been thinking of Edith as Charlie Brown and Julian Fellowes as the Lucy who pulls the football away. But no: We are Charlie Brown, Julian Fellowes is Lucy, and Edith is the football. Mary’s eagerness to honor Lord Merton and Isobel—her godfather and the grandmother to her son—makes a welcome change from the pert, casual cruelty she’s been toying with lately. She seems to have taken to heart Violet’s advice that “a lack of compassion can be as vulgar as an excess of tears.” If only Lord Merton’s sons could be as kind. Poor Isis. But Cora is right: There are far worse ways to go, and none much better, than being quietly comforted by people who love you and each other. The newly restored devotion between Cora and Robert is touching—even inspiring, if it lasts.